Afro-Caribbean specialist Chuck Silverman will be teaching a Master Class on Monday, June 20 at 6:00 pm. Some information from the clinician himself: “The Master Class features a very detailed handout and lesson plan. I can instruct as to realistic and practical applications of latin rhythms to the drum set. As you may know, I teach at the Musicians Institute and have 50+ students in my Advanced Drumset – Latin classes. My focus is not only on “need to know grooves” for professionals (i.e. a pro sounding bossa, samba, songo and some “latin jazz-y” chops) but also on modern Western pop songs that use “latin” rhythms. Groups like Beastie Boys, Alien Ant Farm, Foo Fighters, Lettuce and The Mars Volta all use latin rhythms in one way or another. I have transcriptions of these grooves along with, of course, the original tunes. This is definitely a focus of my master classes, workshops and private lessons. It makes the study much more viable. Students get to hear why they should know these rhythms.” The class will run about 2 hours, and admission is $15 a person. Lessons are also available prior to the master class ($40 for an hour lesson). To sign up, call us at (614) 885-7372. 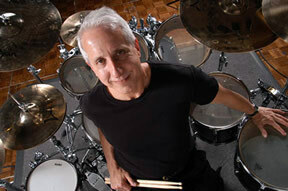 To find out more about Chuck, visit his website or check out his page on Drummerworld.